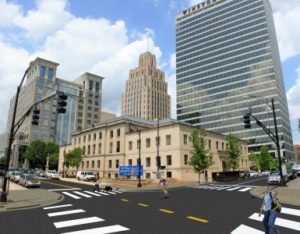 With the North Carolina Department of Transportation’s planned Business 40 improvements project (TIP U-2827B) scheduled to begin in 2016, the City of Winston-Salem knew the downtown street network would be forever changed. NCDOT’s plan included the elimination of several interchanges through the Downtown Winston-Salem area, and the modernization of ramps and bridges. The City of Winston-Salem assembled a Joint Chamber of Commerce Downtown Winston-Salem Partnership Business 40 Task Force to fully understand the potential impacts of the project on traffic patterns in downtown Winston-Salem as it related to the business environment and long-term economic development implications. As a result of the work of the Task Force, a list of recommendations was developed. DAVENPORT was selected to conduct a comprehensive study of the downtown Winston-Salem street network. Our study includes examining the feasibility of converting designated streets from one-way to two-way traffic; conducting a comprehensive study of parking, pedestrian crossings and access to downtown businesses; examining measures to slow traffic; making recommendations to provide clear directional signage around Business 40; and recommending pedestrian and bike accommodations. Due to the high visibility and interest in this project, public involvement was a major component of this study. DAVENPORT worked closely with all stakeholders including city officials, downtown business owners, downtown residents, the Chamber of Commerce, and the Downtown Winston-Salem Partnership. DAVENPORT’s role included creation of project information website, citizen survey, and leading multiple public informational meetings and workshops. DAVENPORT’s staff has created project graphics including a project logo, flyers and presentation boards with concepts and renderings of what proposed improvements would look like. Of particular interest to future downtown development and growth was the need for additional parking in key areas. DAVENPORT was able to work with the stakeholders to provide conceptual designs which included additional parking in the areas of concern. 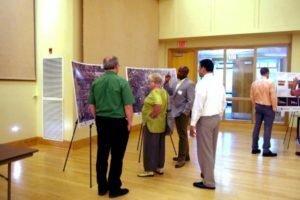 DAVENPORT’s work with the key stakeholders and public has aided the citizens of Winston-Salem in understanding the potential changes to be made to the downtown street network. The goal of the project was to aide the City of Winston-Salem in their decision making process for implementation. Our team is provided assessment of existing conditions, conditions during and after construction of U-2827B with recommendations for roadway improvements, two-way conversions, parking, and traffic management of the Winston-Salem Dash Stadium. In addition, the final report included recommendation for pedestrian and bicycle accommodations and traffic calming.